Anglo-Saxon Invasions - As its empire declined, the Romans had to abandon Britain in 410 in favor of defending its lands closer to home. Their control over Western Europe was contracting and this island off the mainland could no longer be maintained. Meanwhile, Germanic tribes were expanding in all directions. The Gothic invasions of the Roman Empire in the 5th century are well known. At the same time, three other Germanic tribes called the Angles, Saxons and Jutes sailed from northern Europe across the North Sea, and settled on the island of Britain. Some say invaded. The first known reference to these migrations comes from a native Briton named Gildas. He called it, in his work De Excidio Britanniae (On the Ruin of Britian), the Adventus Saxonum. The sources for this period are several, sketchy and often conflicting. Gildas' letter is the earliest and only surviving contemporary document that exists. However, it is not a history (which is good because in contains several inaccuracies), but more of an epistle. Bede's Historia ecclesiastica gentis Anglorum (The Eccesiastical History of the English People) completed in 731 is considered the most extensive and reliable of this era in Britain's history (see Bede). In addition, the other important works include the Historia Brittonum (History of the Britons) attributed to the 9th century Welsh monk, Nennius, the Anglo-Saxon Chronicles, author unknown, but compiled at the time of Alfred the Great, and the Historia Regum Britanniae (History of Britain's monarchs) by Geoffrey of Monmouth in the 12th century. But there are problems with these latter sources. The Historia Brittonum is a very unorganized account. Seven complete copies of the Anglo-Saxon Chronicles exist, but they do not all agree and the earliest parts are based on oral tradition. And the Historia Regum Britanniae is a mixture of history and legend, and separating the two is difficult. The exact year the migrations began is unknown, but tradition holds that the first Anglo-Saxons landed on the Southeast Coast at Ebbsfleet in 449, and they continued to arrive for about a century and a half. Many consider this to be the beginning of "English history" (as the country would eventually be named "England" after the Angles). There is also debate about why they came in the first place. Were they fleeing other barbarians like the Huns as the Goths had, or were they simply looking for more fertile lands? One thought is that, with the retreat of the Roman armies, they were hired by the Britons to protect them from native Celts, namely the Picts and Scots, who had been pushed into the highlands by the Romans centuries earlier. When Rome withdrew, not all its people left. Some stayed behind to fend for themselves. The accounts mention Hengest and Horsa, the first Germans who were hired as mercenaries by Vortigern, King of the Britons. But their historicity cannot be verified. Some consider them mythological, others historical. Hengest is considered the traditional founder of the Kingdom of Kent. But to the Britons' consternation, the invaders turned on the very people they came to protect after they repelled the Celts. Whether invited or not, it took years (at least 50) for the Angles, Saxons and Jutes to conquer the lowlands and start carving out their own little kingdoms for themselves. Archaeology has confirmed a dramatic shift in culture at this time. The Germanic language we now refer to as Old English made its first appearance, while Latin and the Celtic languages virtually disappeared in the lowlands. Christianity was also replaced by paganism. The Jutes took Kent and the Isle of Wight. The Saxons settled in Sussex (South Saxon), Wessex (West Saxon) and Essex (East Saxon). And the Angles inhabited East Anglia, Mercia and Northumbria (the land north of Humber). The Anglo-Saxon Chronicles list the first monarchs of these early kingdoms. The aforementioned Hengest in Kent was said to have arrived first in 449. Then came Ælle in 477 who ruled Sussex. He is recorded to have been a strong warrior, taking his land by force. 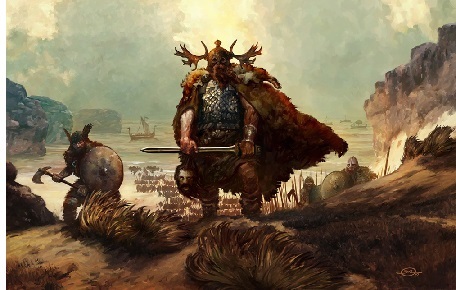 Cerdic was next in 495; he took Wessex. While Ælle and Cerdic are thought to be real, the founders of the other kingdoms are considered somewhat more legendary. The first recorded king of Essex is Æscwine, of Northumbria is Ida, of East Anglia is Wuffa and of Mercia is Crida.